Climate change is one of the greatest challenges currently facing humankind. It will increasingly impact rural small-scale farmers in developing countries, as well as agricultural practitioners partnering with them. Development workers will not only be increasingly asked to respond to emergencies caused by climate change, but expected to help communities adapt and build resilience to possible shocks (example shown in Fig. 1). Climate change has serious repercussions for food production, natural resource management (NRM) and reliance on agriculture for both poverty alleviation and economic development. 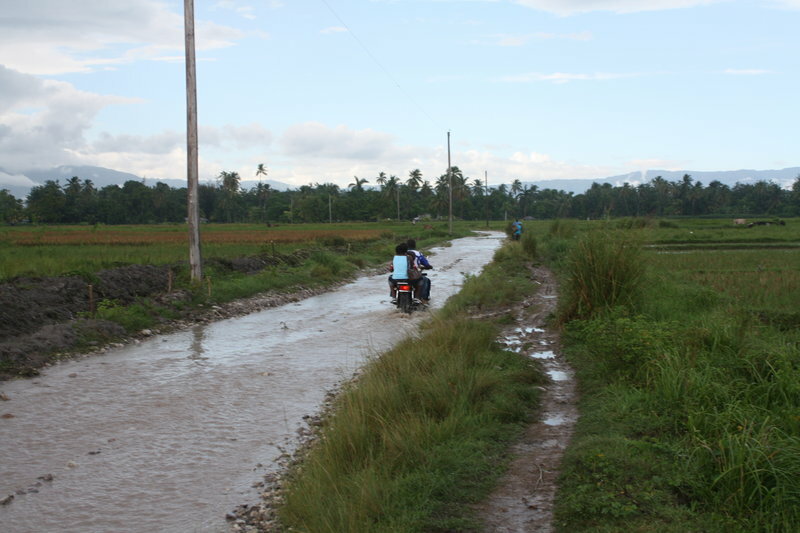 Figure 1: Flooded agriculture road after several days of heavy rainfall (Source: Brian Flanagan). This document draws from the MEAS brief #3 Adaptation under the New Normal of Climate Change: The Future of Agricultural Extension and Advisory Services. Written for extension and advisory service providers, the MEAS brief contains insights helpful to practitioners working to develop strategies for helping small-scale farmers adapt and build resilience to the effects of climate change. This document will first discuss climate change and related impacts on small-scale farmers. It will then outline general climate change strategies and when to apply them, finishing with some key points that development workers should consider when helping small-scale farmers cope with climate change. 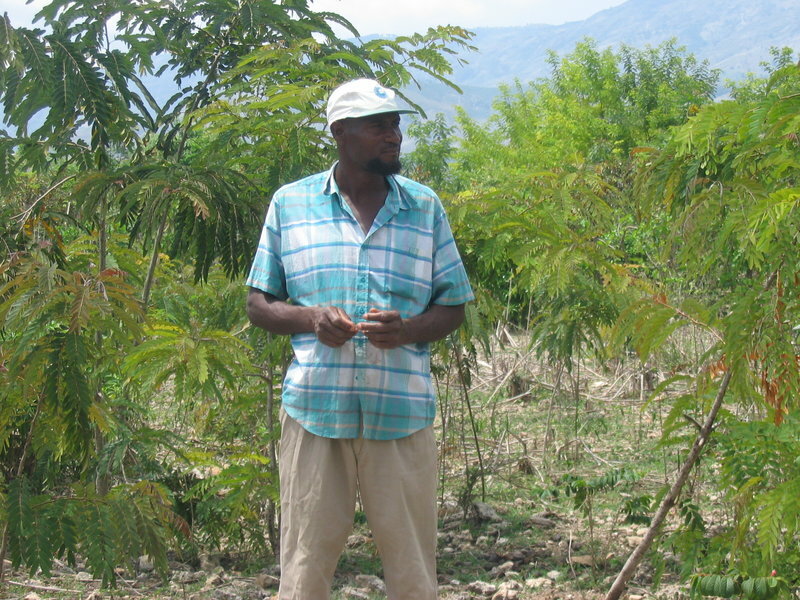 To help small-scale farmers cope with climate change, it is important that development workers understand the subject. This requires understanding the nature of the change, associated challenges and likely impacts. It will be a slow process that is highly complex, with no return to previous climate conditions in one's lifetime. The changes will impact various weather features including air temperature, amounts and patterns of precipitation, and frequency of severe weather events. In turn these weather features will cause pressure on a complex web of relationships among social, environmental, economic, and food systems. Two dimensions of this phenomenon which will provide a challenge for small-scale farmers and those working with them are climate change trends and weather disruption. An increase in water cycling through the climate system as warmer air carries more moisture, with predictions that the resulting distribution of moisture will be non-uniform---dry regions will likely become drier and wet regions will likely become wetter. Figure 2. 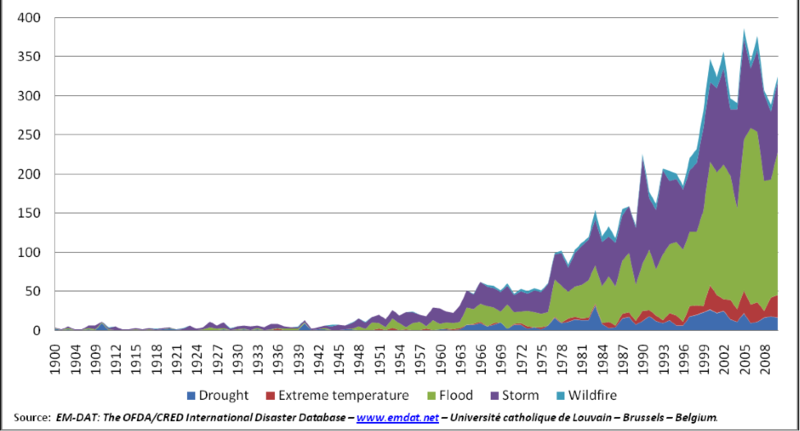 Number of extreme weather events globally, by year (Source: Simpson and Burpee 2014). Severe weather events are occurring more frequently (Fig. 2), for longer periods of time, and with increased severity. These events include heat waves, droughts, floods and hurricanes/cyclones/typhoons. Warmer air carrying additional moisture, together with the increased energy stored in the oceans, is leading to more intense and frequent storms as well as systemic changes to rainfall. It is predicted that extreme heat events that typically occur every 20 years will occur as often as every two years. Rare events such as once-in-50-year storms will occur more frequently. Older and more experienced farmers around the tropics have been discussing changes they have observed in the weather and climate over several decades. These changes can continue to be expected, with areas dependent on rainfed agriculture being especially vulnerable as the length and start of the rainy seasons becomes less predictable. It is projected that by 2100 the average growing season temperature will exceed temperature tolerances for many crops in their current growing region. Rising sea levels from glacial melt will overwhelm low lying islands and coastal areas. This will lead to increased saltwater intrusion in coastal river and ground water systems, displacing a large number of the world's population living less than 10 meters above sea level. Many rural farmers already struggle as natural resources degrade. As the impacts of climate change trends and weather disruptions increase, there will be a continued depletion of the assets of the rural poor. As human, financial, natural, social, political, and physical assets decline, it will take longer for rural communities to recover from even modest shocks. Fortunately, one of the strengths of rural communities is their ability to adapt to changes affecting their livelihoods. Given access to the necessary knowledge and tools, they will be equipped to adapt to changes in climate. The strategies used to address climate change and/or its impacts should help vulnerable rural communities to mitigate, adapt and/or build resilience. Mitigation strategies alleviate risks of further climate change by conserving carbon stocks, decreasing CO₂ emissions, and using trees and soil organic matter to sequester atmospheric CO₂. Adaptation strategies adapt communities' livelihoods to changes in weather patterns, and restore natural resources. Resilience strategies strengthen the ability of natural and human systems to withstand and recover from shocks. Many rural communities are suffering because of degradation of natural resources. With impacts of climate change furthering this natural resource degradation, it is important that individual agriculture-related climate change strategies address larger landscape and NRM challenges. In assisting farmers to cope with climate change, the greatest challenge for development workers is to provide sound advice to farmers, helping them to make specific adaptive change while also determining the appropriate timing, nature and location of each intervention. When making the transition from current to expected future conditions, one must keep in sight the context of location-specific problems, appropriate scale, time frame and availability of resources. Development workers can be the link between rural agriculture populations, sources of climate change information and the tools needed to adapt. With resources often scarce or difficult to access for rural communities in developing countries, the development worker is often better positioned to access and stay up to date on the latest information. 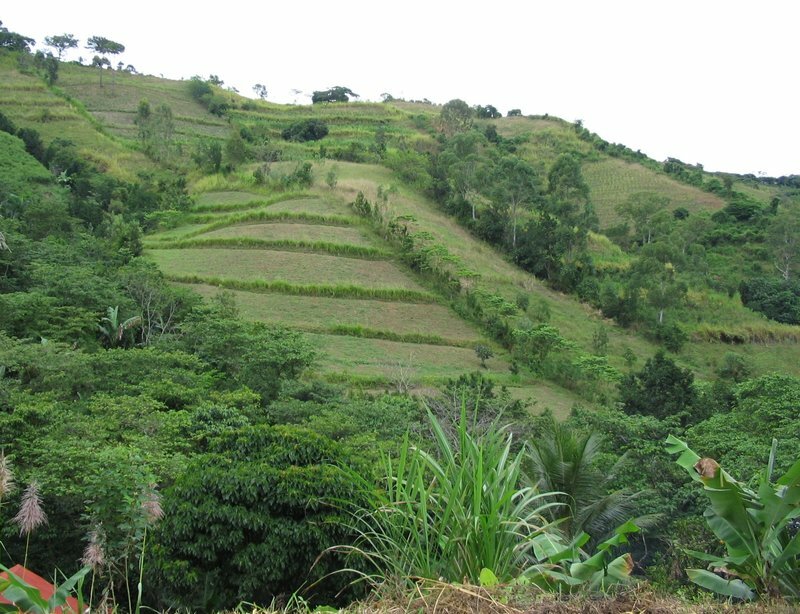 Figure 3: Agroforestry adopted in an area of low rainfall and crop productivity (Source: Brian Flanagan). Development workers also should take advantage of networking opportunities, both at national and international levels, to access potential technical and social solutions. Developing appropriate adaptation strategies requires that the development worker has the knowledge and skills necessary to prepare communities for the complex and varying effects of climate change. This can be done by learning how others have adapted to significant changes in climate. This includes learning from the local community, international NGOs, research institutes, and government agencies responses. Increase, add or develop drainage systems to manage extreme rainfall events. Strategy choices are difficult, and the best timing for adaptive measures is rarely obvious. The best way forward can depend on local and external resources and costs; individual, social and institutional capabilities; evolving markets; and national policy framework. Benefits from some climate change technology and management choices are only possible under specific sets of conditions. Development workers also need to assess the vulnerability and resilience of both human and natural resources in order to best allocate and utilize those resources. Such complexity requires detailed, advance planning and informed decision making. Development workers will need to help communities understand that responses to climate change will require truly adaptive measures and that weather patterns will not return to the way that they were. There is also potential for panic and destructive short-term behaviors, so it is important to be aware of this and discuss the negative impacts of these behaviors with the community before they occur. This will require having developed trust and credibility as is needed when working with any community. To be effective, climate change adaption strategies must also involve strengthening the community's understanding of the local ecosystem's functions. Adaptive management of local natural resources, for example, is most likely to succeed when a diverse group of community members from the same watershed are involved, with each member contributing their unique perspective and ideas. Figure 4: Soil conservation terracing on hillsides to decrease erosion from both large storms and annual plowing (Source: Brian Flanagan). To build collective buy-in, it is best to start with 'no-regret' strategies. These are strategies that will strengthen overall resilience and improve productivity, regardless of whether climate change shocks occur or not. For instance, many of the land management strategies related to NRM-oriented agriculture (Fig. 4), not only help farmers adapt to climate change but also enable them to improve the resilience and profitability of their lands and livelihoods. It is also important to test potentially innovative practices while risks are low. Observable benefits of NRM changes generally take time to develop and can be hidden by seasonal stresses. This often causes individuals and communities to be slow to implement NRM changes. As local weather patterns change, however, small-scale farmers will eventually be pushed to take up new practices. Disasters also can initiate rapid and large-scale adoption if development workers are prepared to make the most of these difficult but potentially teachable moments. This was the case in Central America after Hurricane Mitch in 1998 where families who had not implemented living and rock contour barriers lost their hillside plots to erosion and runoff. In neighboring plots, where contour barriers had been implemented, there was either less damage or none at all. These observable, stark contrasts led families who were previously reluctant to change, to start requesting trainings and adopt the practices and technologies. As they had witnessed the importance and interrelations of NRM and agriculture management, they could see the impacts these strategies had. Another lesson from Hurricane Mitch is that a technology or practice should be targeted at an appropriate scale which, in this case, included hillsides within a watershed. Development workers need to be observant of these teachable moments and help encourage farmers' innovative and adaptive capacities. The challenges presented by climate change are large and many. As many of the impacts will adversely affect the poor in rural agriculture communities, it is vital that development workers respond to help small-scale farmers adapt to the changes. By accessing current information on the topic, increasing the local community's understanding of the situation and having farmer buy in, development practitioners will help communities adapt to climate change. Simpson, Brent M., and C. Gaye Burpee. 2014. Brief # 3 Adaptation under The 'New Normal' of Climate Change: The Future of Agricultural Extension And Advisory Services. Modernizing Extension and Advisory Services. Simpson, Brent M., and C. Gaye Burpee. 2014. Discussion Paper # 3: Adaptation under the "New Normal" of Climate Change: The Future for Agricultural Extension and Advisory Services. Modernizing Extension and Advisory Services. Agriculture in Times of Climate Change (Best Practices Note #2). A Toolkit of Resilient Agricultural Responses to Climatic Challenges in Tropical Asia (Asia Note #16). A Toolkit of Resilient Agricultural Responses to Climatic Challenges in Tropical Asia (ECHO Slide Presentation).